2 - 3.............Palma von Ellendonk. 4 - 4,5..........Dixi vom Krakau. 4 - 4,5..........Fred von der Blütenstadt d'Orsoy. SchH 3: 99-96-96 = 291 points. Ilo vom Kirchbühl competed in the D.V. Meisterschaft and passed the Körung 'for life' with highest possible rating for hardness, courage and working drives. 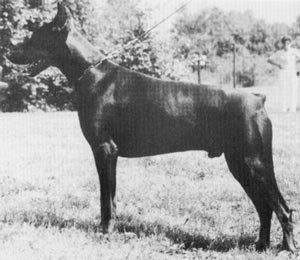 His sire, Bingo von Ellendonk, was the winner of the D.V. Meisterschaft in 1977 and passed the Körung 'for life' with highest rating for hardness, courage and working drives. Ilo's maternal grand-sire, Falk vom Rotbachtal, also passed the Körung 'for life' with highest rating for hardness and working drives. Alf: SchH 3, FH and passed the ZTP with 1A rating for character and SG for conformation. He is sire of the von Warringhof “J” litter (Janka) and vom Katharinental “A” litter (Axel). Anjuschka: SchH 3, FH and dam of the vom Altrhein “H, J, K, L” litters (Kira). Iska: IPO 1 and dam of the vom Holzbergerhof “K, N” litters (Kid, Kay, Kayte). Jordan: SchH 3 and sire of the van de Kusthoeve “T” litter (Tall, Titan). Lima: SchH 3, FH and dam of the Davina van de Eland “U” Litter (Unique).